Let it be known that only the best and the brightest that made it through the academy beyond this sign. 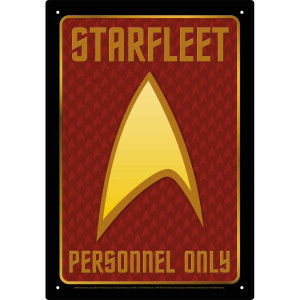 Get the Star Trek Starfleet Personnel Only Tin Sign so everyone knows you’re a true fan of the elite personal of Starfleet. I’ve just received this and have put it on my door immediately so it’s only a few feet from my Star Trek door chime. It looks great on the door and is nicely made. I’m glad I bought it and recommend it for all crew quarters doors. It is a simple aluminum sign. It ooks good and I like it.